On Friday night, April 27, U-turn student ministries kicked off their IMPACT weekend and were joined by students from other area churches. U-turn students lead the worship and then a powerful message was delivered by Rev. Jonathan Church. The altar service was special as students cried out to the Lord. Afterwards a time of fellowship closed the evening. Students returned on Saturday for a time of devotion, games, lunch and then an afternoon of skating at Let’s Skate ORLANDO in Winter GARDEN. As I sit here looking at the harvest God has given Ocoee COG, I’m thankful and humbled. Glad I can spend the afternoon with these great students. Their leader, Rebecca Smith is doing a fine job leading these students to a real relationship with Christ. Lord, help us reach this generation for You. So, it’s Monday and I feel like I have been ran over multiple times by a big truck. Well, last week was spring break for Orange County, FL. Our week was full of events – including a trip (Mon-Wed) to my home town, Starke, FL to see family and a trip to Disney World on Friday with the children! That was in addition to Wednesday night service, and I also preached on Thursday night and Saturday night at two different churches in my region. 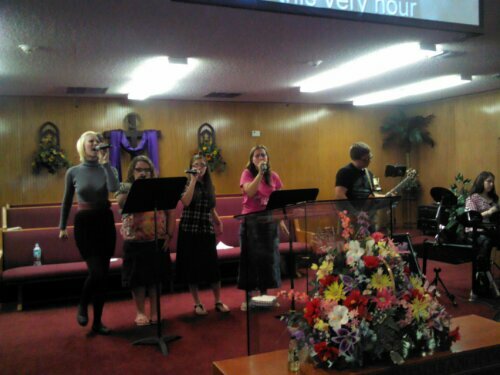 There were also the two choir practices (Saturday afternoon and Sunday afternoon) that took up some time. Our choir is preparing for the Easter Musical in just a few days! So, as I sit here and recollect all that has occurred the last few days – I really don’t feel bad that I’m just TIRED! Easter is just a few days away and we are planning some great things! Be sure to check out our webpage at http://www.ocoeecog.com or our FB page facebook.com/ocoeecog for all the details!